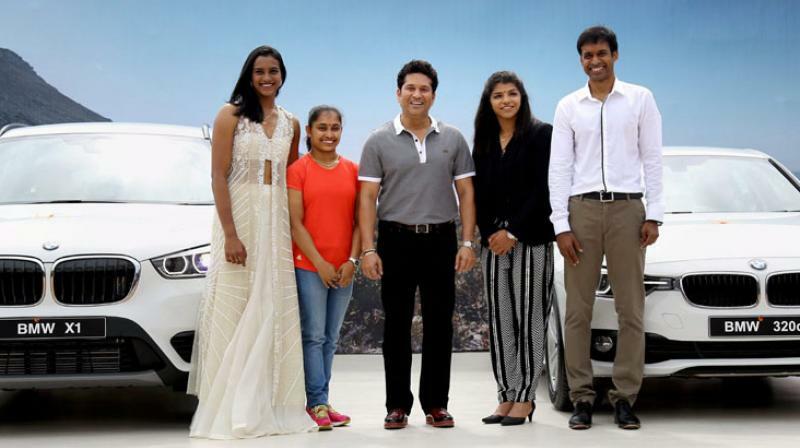 Sachin Tendulkar Presents BMW Cars To PV Sinadhu, Sakshi, Dipa, Coach Gopichand :- On Sunday, Cricket legend and Little master blaster Sachin Tendulkar presented BMW cars to Rio Olympics silver medallist shuttler P V Sindhu and bronze winner wrestler Sakshi Malik along with gymnast Dipa Karmakar and badminton coach Pullela Gopichand. President of Hyderabad District Badminton Association – Chamundeshwarnath gifted the luxury BMW cars to the four sports persons for their outstanding achievement and performance in the recently-concluded Olympic Games 2016 in Rio de Janeiro, Brazil. The Goodwill Ambassador of the Indian Team at Rio Olympics – Sachin Tendulkar handed over the keys of the cars at a function at Gopichand Badminton Academy. Shuttler PV Sindhu won the silver medal in women’s singles making her the first Indian woman sportsperson to win a silver in the Olympics under the guidance of chief coach Pullela Gopichand. Wrestler Sakshi Malik had bagged a bronze in women’s freestyle 58kg class. Dipa Karmakar missed a medal by a whisker. She had finished at the 4th position in the vault event and stunned the world by attempting the risky Produnova vault.